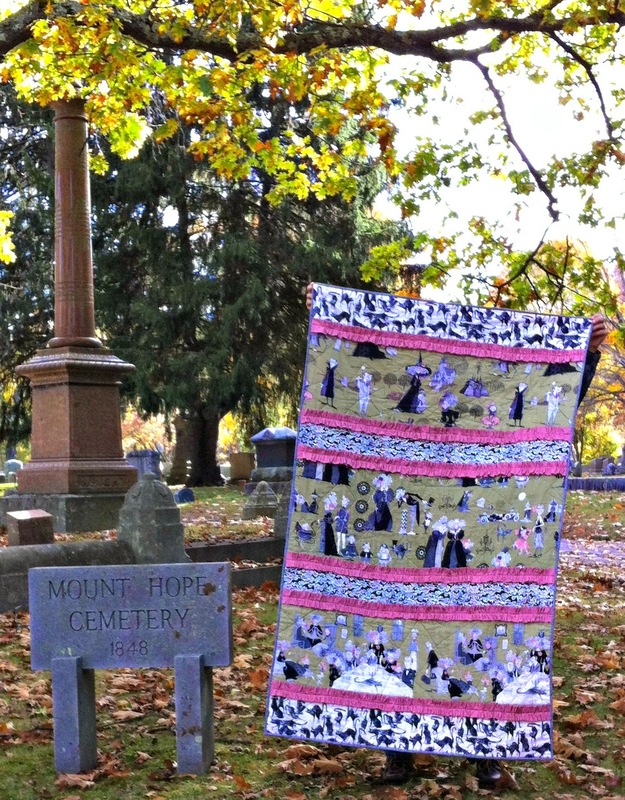 I'm just dying to share my latest Ghastly creation for the Blogger's Quilt Festival. I have been obsessed with this fabric line since it came out. With each new release I add more to my collection so I have to keep coming up with creative ways to use it. I've had this one in mind for a while... it's sort of a mash up of my Cracking Up quilt and this Beachy Wave quilt. I started with a simple strip pieced quilt using the fabric repeat to determine the width of the strips. 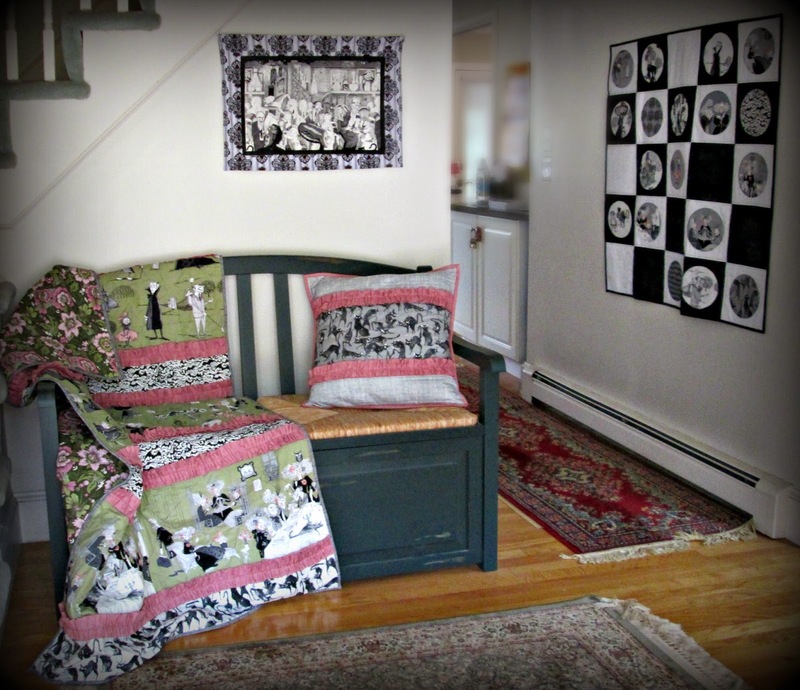 I pieced the strip quilt and quilted it using a simple broken glass pattern before adding the ruffles. The ruffles are a little tricky. I cut two strips 5" by the wof and joined them end to end then sewed them right sides together along the long side to make a really long tube. When gathering I find it easiest to set my stitch length to the longest length and turn my top tension all the way up to the highest setting. I sewed two rows of gathering stitches down either side of each ruffle. The key for easier gathering is NOT to catch the seam allowance in your basting stitches. I pinned each ruffle to my quilt adjusting them so the gathers were fairly even and then top stitched down the center of each ruffle using coordinating thread. 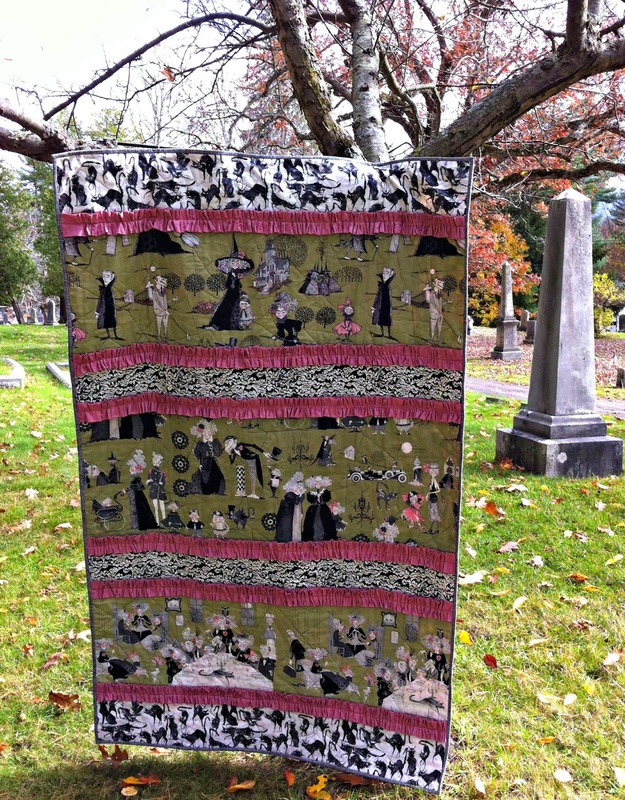 My undying admiration goes to Amy for once again organizing the Blogger's Quilt Festival!!! 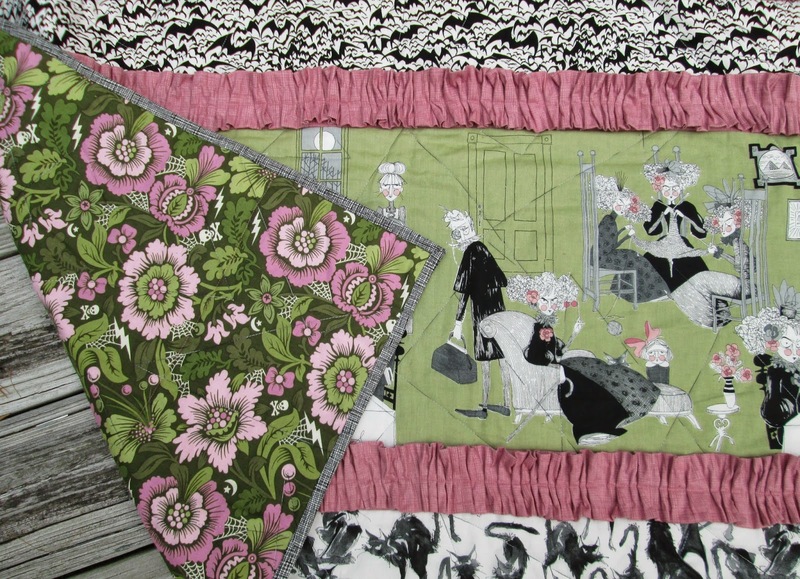 I've entered this in the Small Quilts category. The end is near, today is the last day to enter your quilt. Don't be left behind! 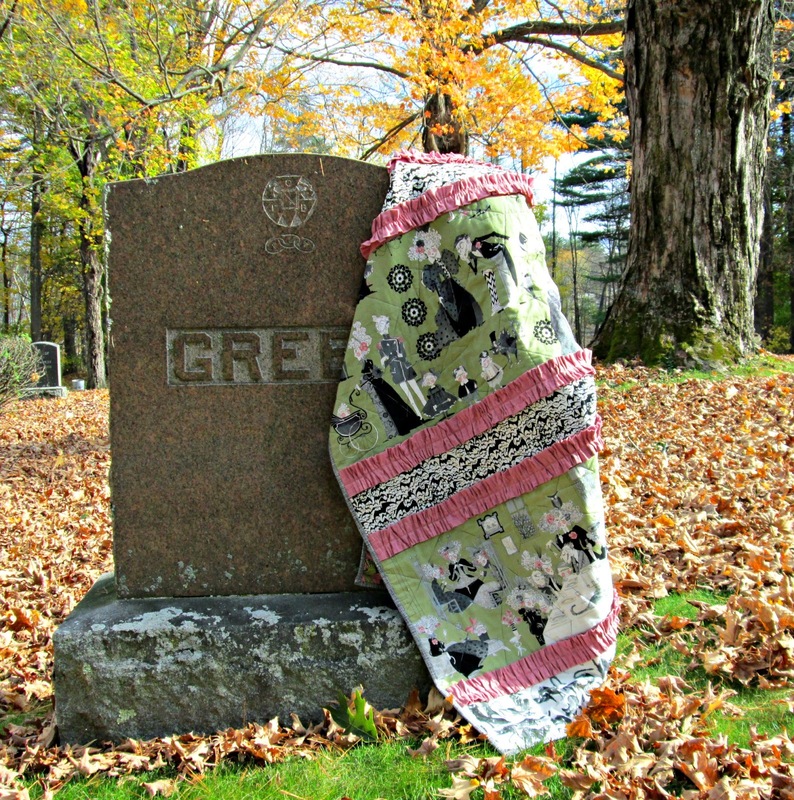 Also linking up to the fabulous Finish it Up Friday by Crazy Mom Quilts. 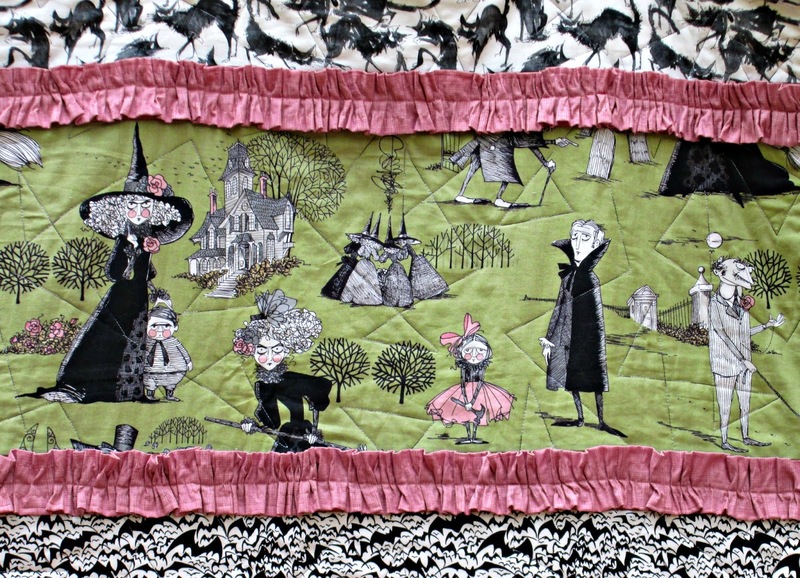 Finished quilt is 40" x 68"
Fabrics: from the Ghastlies collections by Alexander Henry, Heath. Backing: Absinthe Spider Blooms from Nightshade by Tula Pink. Binding: Architextures by Carolyn Friedlander. Alice, what a surprise running into you today at Quilters Way in front of the .... Ghastlies!! 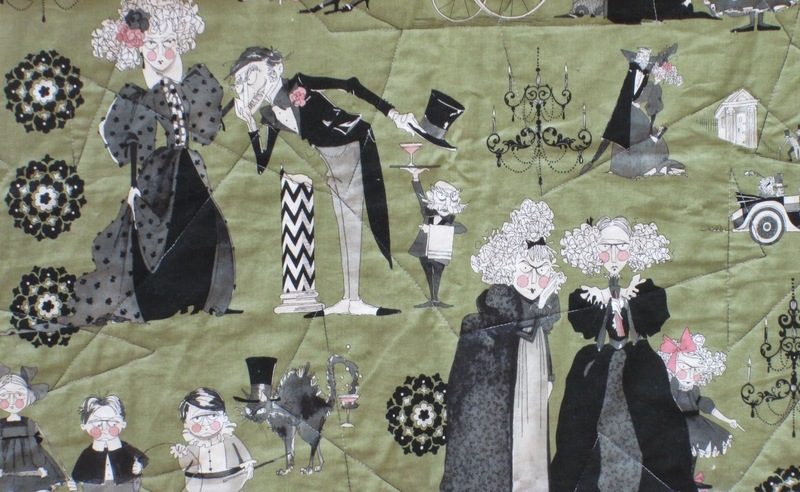 Love your ruffly Ghastly quilt and Ghastly decor. I, too, am in love with this fabric line!!! I saw that someone had used the cat print with a solid on a simple bag, but I think that one of these prints and a ruffle on a bag would be awesome!! X! I love the ruffles, great job! What a perfect setting for your Ghastlie photo shoot! I love that pink ruffle idea. Beautiful quilt! Love those pink ruffles! Adds a jazz to the quilt. Oh that backing can't be more perfect! I love your ghastly foyer! No wonder you love this fabric. It's super-cute.